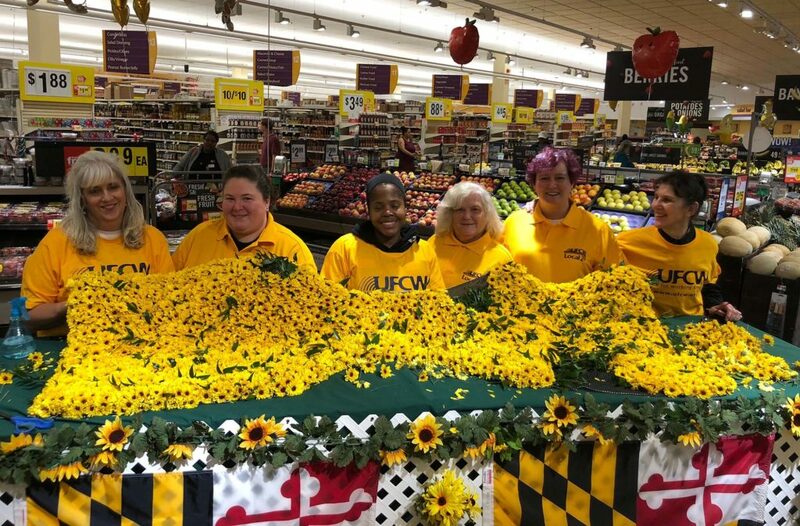 Talented UFCW members at Giant Food Store #108 in Baltimore, Maryland carefully weave together the yellow flowers that are awarded to the winning horses at The Preakness Stakes held each year on the third Sunday in May. Nicknamed “The Run for the Black-Eyed Susans,” the Preakness was first held in 1873 and second only to the Kentucky Derby in North American equestrian events. At both the Kentucky Derby and Preakness, it’s UFCW members who work at neighborhood grocery stores who do the highly-detailed work of constructing the elaborate blankets. While the Kentucky Derby blanket is traditionally made from roses, the Preakness is made from yellow flowers made to look like the state flower of Maryland, the black-eyed Susan. Why not use real black-eyed Susans? The summer-blooming flower isn’t in season until June, so instead yellow flowers such as mums are used as a substitute. Though smaller than the blankets awarded at the Kentucky Derby, the Preakness blankets use ten times the number of flowers. Each flower is individually wired and attached to felt-backed matting so as not to injure the horse.